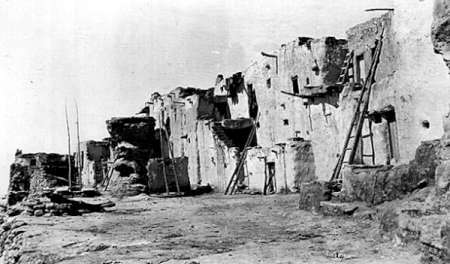 Walpi is a significant Native American site that represents traditional Hopi architecture and identity. 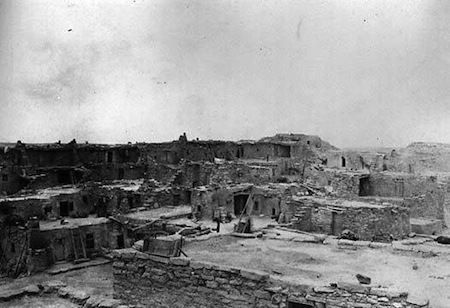 It is one of eleven occupied Hopi settlements. Unlike the other villages, Walpi still does not have running water or electricity. 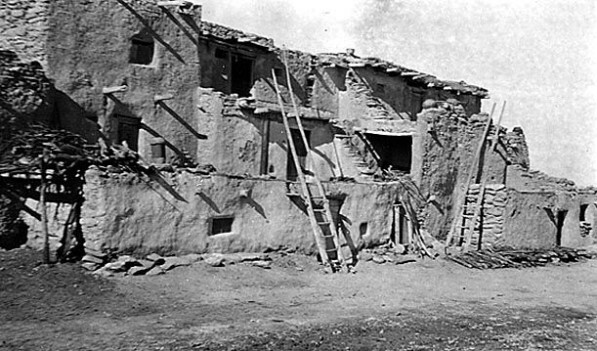 This village was moved to its current location as a defensive measure after the Pueblo Revolt of 1680. Over the years the population has slowly dwindled as tribal members move to more contemporary housing. Today, Walpi is most commonly used for public ceremonies. This photograph of Walpi was taken in 1911. 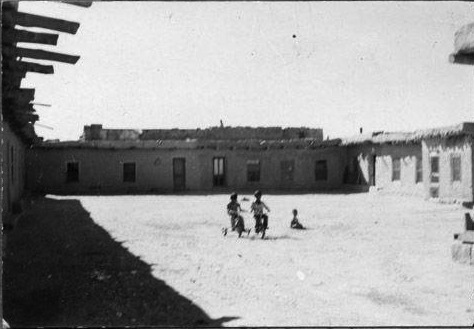 Walpi Dance Court in 1905. Traditional pueblos require a ladder to enter, which is why you can see so many of them here. To enter, you climb a ladder to the lower rooftop. Shorter ladders lead from there to the upper rooms. 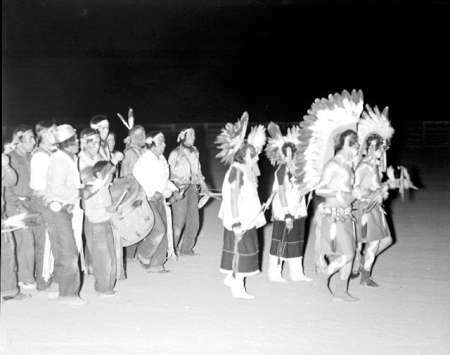 Buffalo Dances are social dances performed by men, women, and children. They deal with fertility, especially the need for winter moisture in the form of snow. 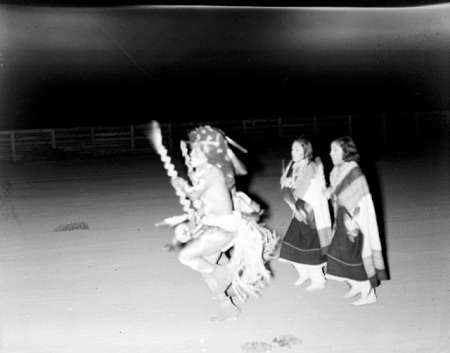 This particular dance was performed at the Navajo Tribal Fairgrounds in Window Rock, Arizona in August 1939. 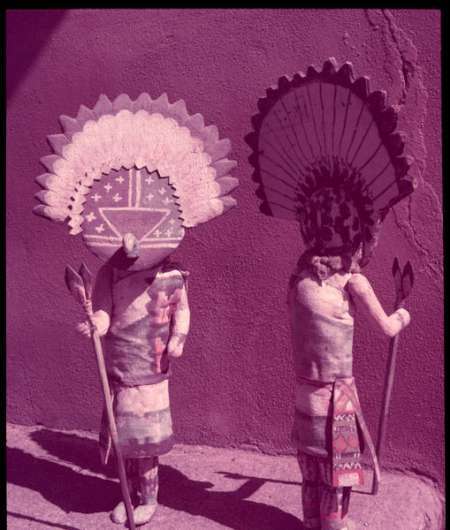 This photograph is of Kachina dancers carved from wood. Kachinas appear to the Hopi from the winter solstice on December 21 until mid-July. They dance and sing in unison, symbolizing the harmony of good thought and deed; harmony required for rain to fall and for a balanced life. The rest of the year the kachinas remain in their home in the San Francisco Peaks. A kachina can take three forms: a powerful unseen spirit, a dancer filled with the spirit, or a wooden figure representing the spirit. Kachina dancers are always male, even when the spirit is female. The men may present gifts of kachina figures to women and children during the dances. Each village sponsors its own ceremonies. 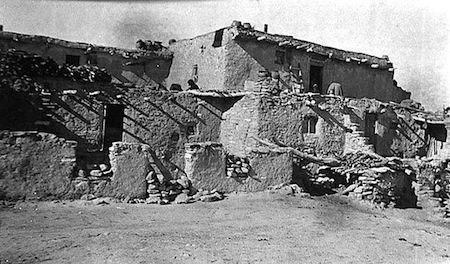 Tewa Village, also called Hano, in 1905. 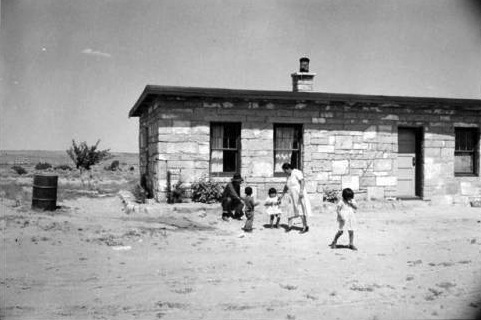 This is where most of the Tewa people settled in the eastern part of the Hopi Reservation. 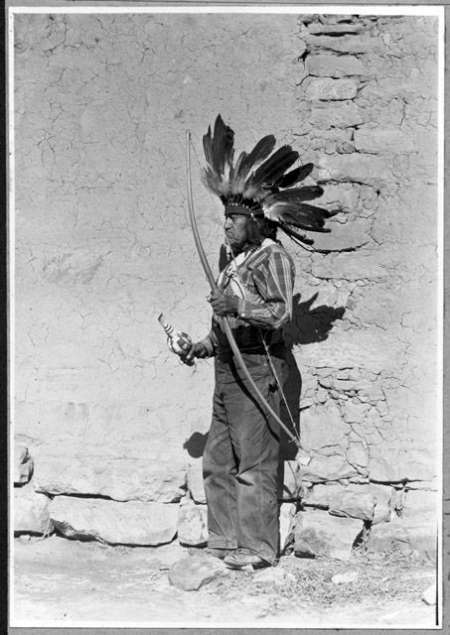 The Arizona Tewa Indians (also Hopi-Tewa, Tano, Southern Tewa, Hano, Thano) are a Tewa Pueblo group. 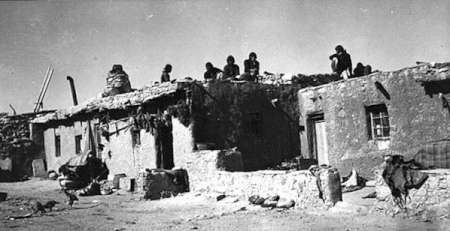 They came to the Hopi as a means of protection for the Hopi people from neighboring raiding tribes such as the Navajo and Apache. 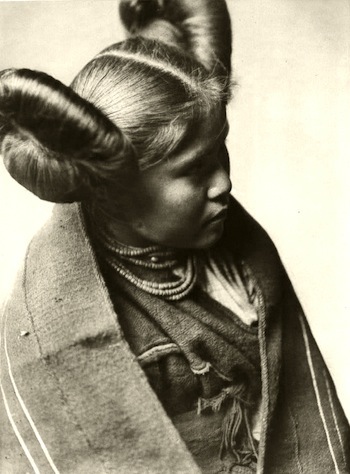 Chaiwa, a Tewa Indian girl with a butterfly whorl hairstyle, was photographed by Edward S. Curtis in 1922. 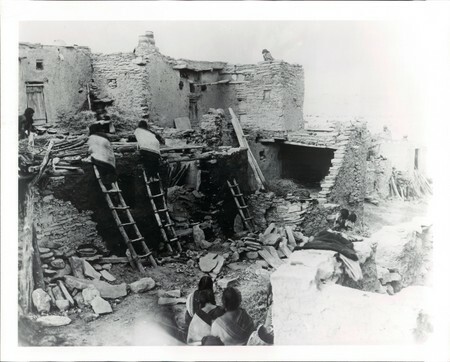 There are about 700 Hopi-Tewas, descending mainly from immigrants who settled at First Mesa following the Pueblo Revolt around 1700. 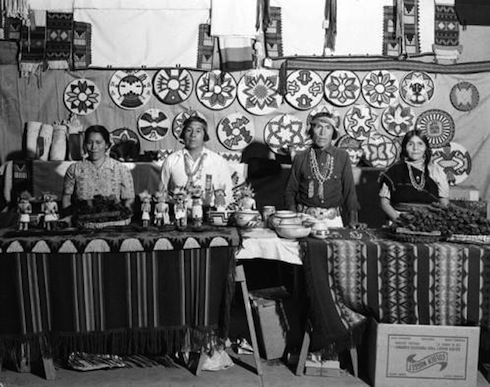 They speak a variety of Tewa, a Tanoan language, and have distinct cultural attributes. Arrow Dance. Taken in August 1939. 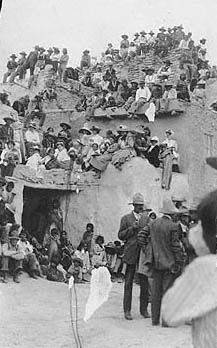 A crowd gathers to watch a ceremony in Walpi in 1911. 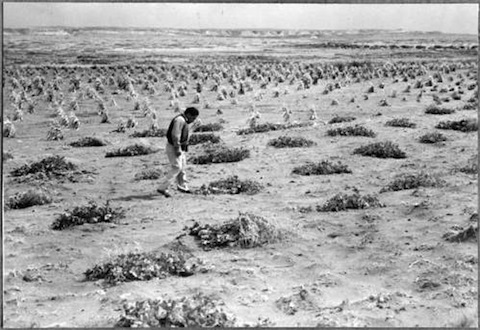 The Polacca Farm on the Wepo Wash. Aug. 30, 1945. Gas pump and automobile at the Polacca store in 1940. An areal photo of the Polacca Day School in 1954. 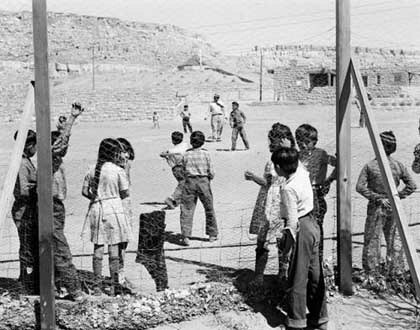 Recreation at the Polacca Day School in the spring of 1944. Children play in Sitsomovi Village Plaza. This was taken in 1940. School children participate in an Easter Egg Hunt at the Polacca Day School in 1944. 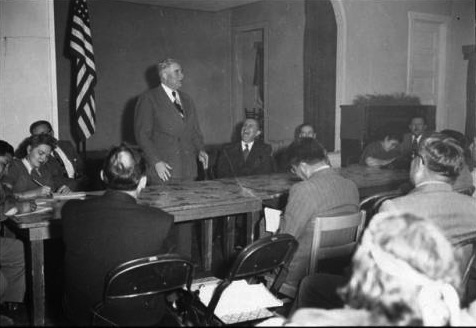 A public meeting with the Secretary of the Interior, Oscar Chapman. Taken circa 1944. 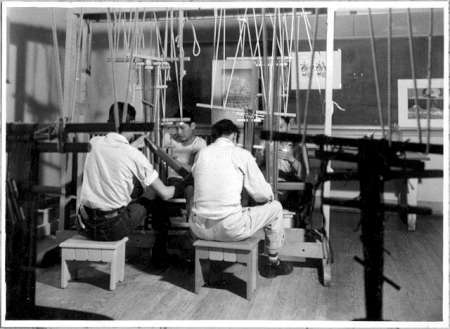 A classroom at Toreva Day School, circa 1944. 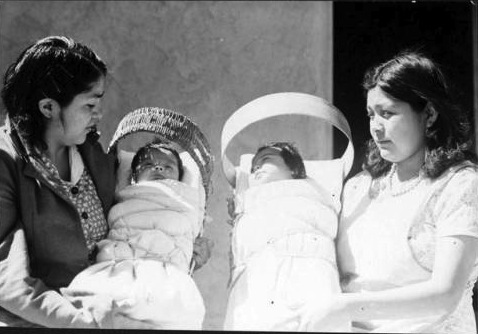 Two women with babies in cradle boards. 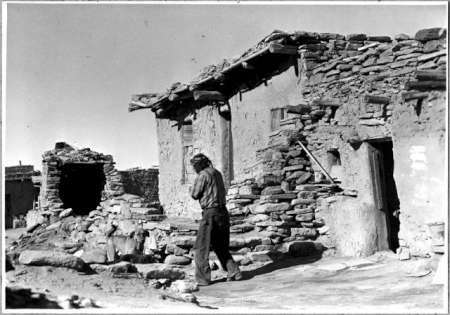 Taken in Tewa Village, First Mesa, 1944. 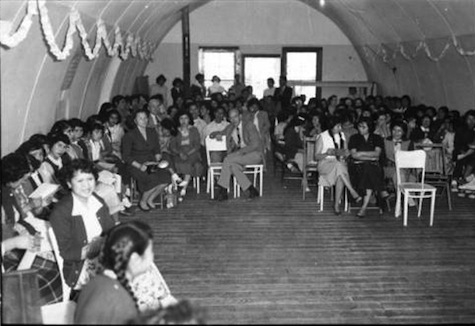 Parents, teachers, friends, Home Economists and 4-H members at the Hopi Reservation 4-H Club Achievement Day held at Polacca Day School in 1954. 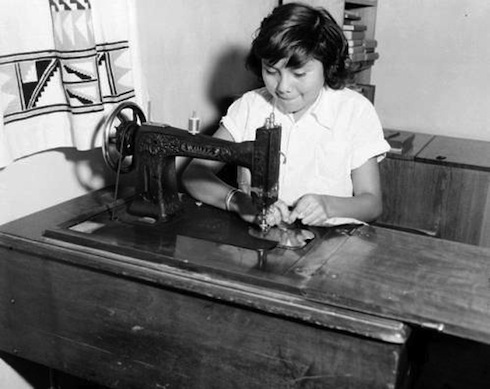 A member of the Polacca Day School 4-H Club sewing. 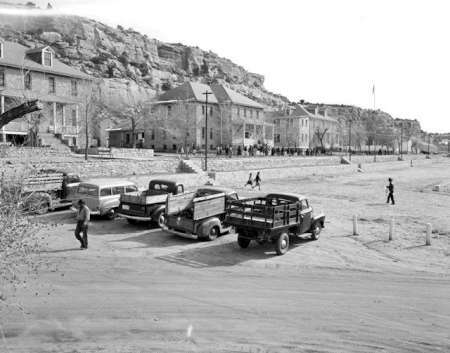 This was taken in 1954. The Polacca U-Needa Stitch Homemakers Club in 1954.Some of the people in this photo are Marcella Kahe, Lorena Pongyesva, Mrs. Shula and Vivian Mumrwa. Laurence House at Five Houses. Taken in 1945. Meeting of Mishangnovi and Supalovi people at theToreva Day School. 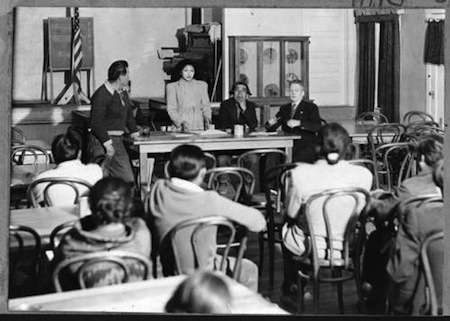 The community meeting was to discuss the subject of forming of a parent teachers association in March 1944. Included i the photo are Andy Selestewa and Lucy Coowikvaya. 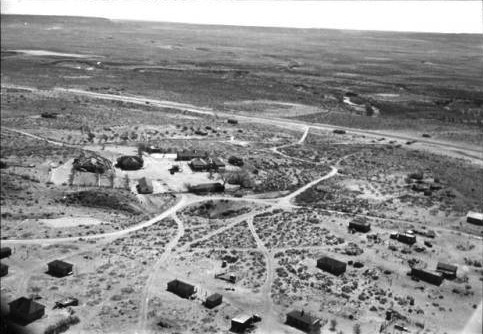 Located three miles from the Hopi Cultural Center, this is one of three villages at Second Mesa.Second Mesa is known for its coil baskets. There are three villages that participate in this type of art: Mishongnovi, Shungopavi, and Shipaulovi. 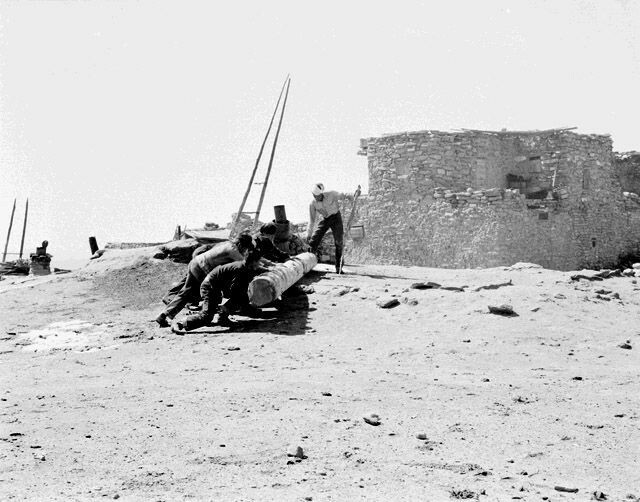 Men rolling a log into position for repairing a Kiva roof inShungopavi Village. This photo of Shungopavi was taken in 1905. 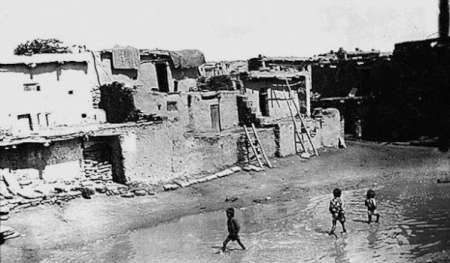 A pueblo in Shungopavi in 1905. Mishongnovi is one of the villages in Second Mesa. In most Hopi areas it is not permissible to take photographs or video. Sadly, illegal photography and a lack of respect for the traditions and ceremonial practices has led to the decision to bar non-natives from attending many Hopi ceremonies. The Snake Dance is part of an elaborate days-long ceremony in which tribal members pray for rain. The Snake Dance is held alternately at the Hopi villages of Mishongnovi and Shungopavi each year. It is said that some of the best long distance runners have received little or no recognition, possibly because they have never run publicly outside the Hopi community. When speaking with Anna Silas from the Hopi Museum at the Cultural Center about Hopi athletes, she spoke of the Hopi runner Louis Tewanima. Tewanima is one of the most celebrated runners in Hopi history and is best known for winning a silver medal at the 1912 Olympic Games. 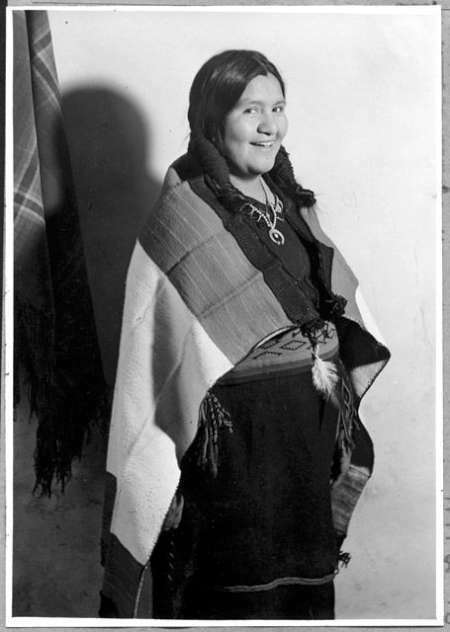 Anna inducted Tewanima to the National Hall of Famous American Indians in Anadarco, OK in the 1980s. 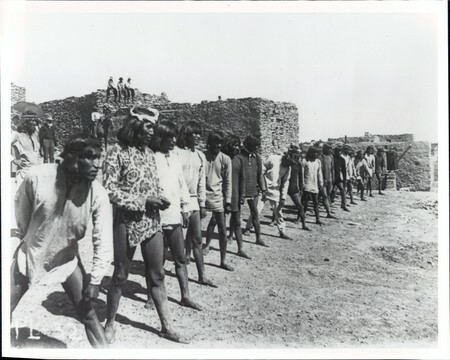 The annual Louis Tewanima Footrace is held at the Village of Shungopavi on Second Mesa. Tewanima's legacy continues to inspire many individuals to enjoy the sport of running. 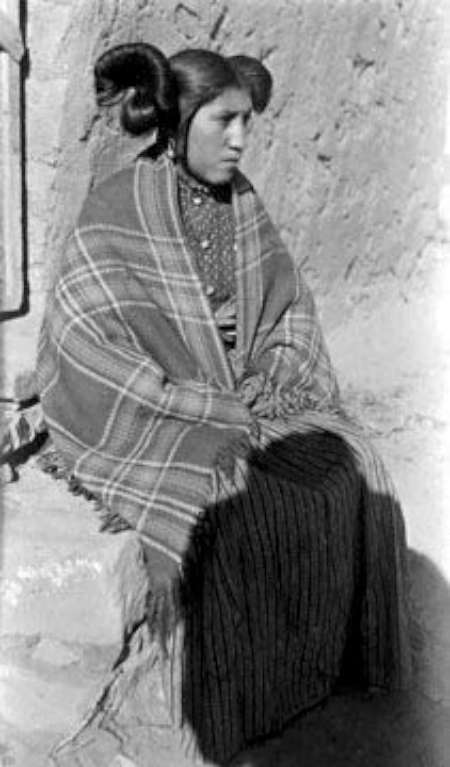 Once a Hopi woman is married, she must either wear her hair down or in braids. This indicates that she is no longer available. They are also presented with the dress and waistband pictured here on their wedding day. The woman in this photo is Eleanor Quyo. It was taken in Mishongnovi Village in March 1944. 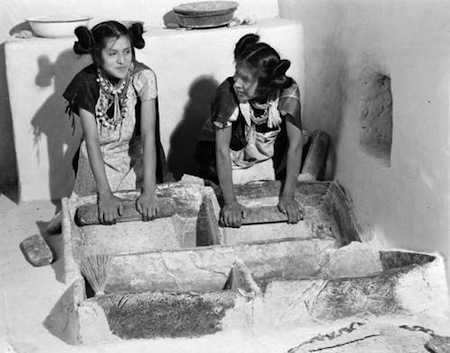 Hopi girls go through a four-day ceremony after reaching womanhood. After the ceremony their hair is worn in side buns to indicate that they are ready for marriage. This photograph was taken in 1905. 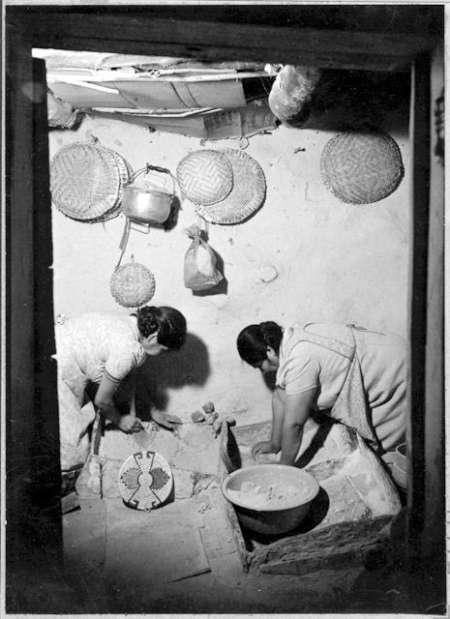 Women grinding corn to make piki in Mishongnovi Villave, 1944. Women carrying laundry to the village from the day school in Shungopavi. April 1944. Two young girls grind corn during a Puberty Ceremony in Shungopovi Village in 1949. On the left is Belvera Nuvamsa; on the right is Mary Anna Nuvakaku. According to the Smithsonian Institute, this ceremony begins with a special prayer on the summer solstice. 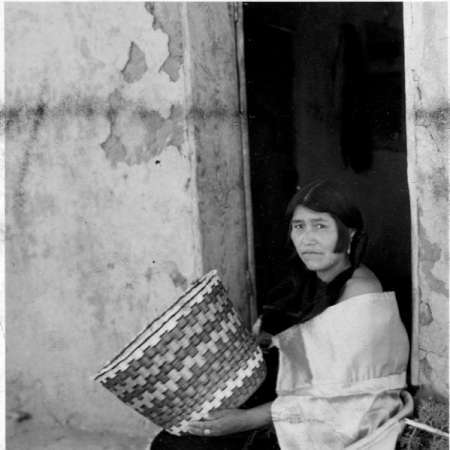 On the second day of the ceremony the young woman will begin grinding corn and fasting for four days. This teaches her that being a woman is precious but hard work. Blanch Tewanima making piki in Shungopavi Village. This was taken in 1944. Mardell Shingoitewain in Mishongnovi shelling corn in 1944. The home of Edith and Alex Dennis in Mishongnovi Village. This was taken in 1944. Peach trees, owned by Clara and Glen Joswytewas, near Shungopavi Village. This was taken in 1944. Two women drying peaches: Hollis Seletstewa and Elizabeth Seletstewa. This was taken in Mishongnovi Village in 1944. Arle Nuvayouma and Arlance Nuvayouma in front of Sammy B's store in Shungopavi Village. This was taken in 1944. Children leaving Shungopavi Day School for a two week visit with families on the California coast. This was a Friends Society Project in 1944. 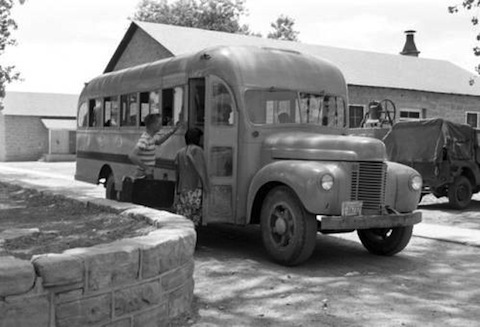 Children watch supplies being unloaded at Shungopavi Day School in 1944. 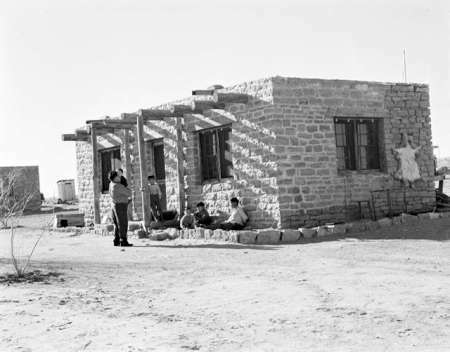 The Toreva School Clinic in 1950. In this picture are corn and melons on Sam Shingoitewa's farm, 15 miles southwest of Toreva Day School. It was taken in 1944. 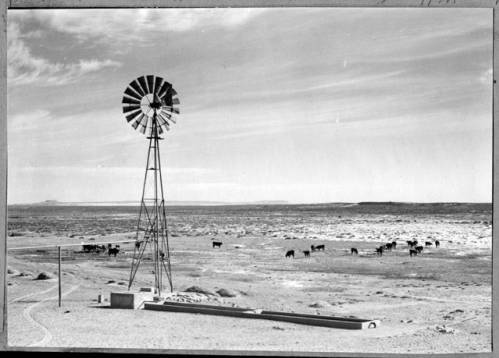 Agriculture and grazing are important activities for Hopi. They perceive agriculture, particularly corn growing, from a different perspective than academics. 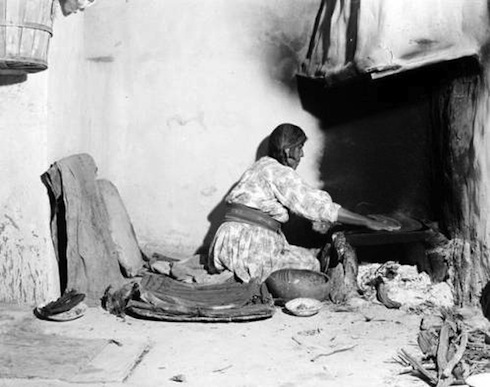 The Hopi believe that when they advanced from the third to the fourth way of life, they received corn from Ma’saw. While the other people chose the largest ears of the corn, the Hopis selected the shortest blue ear corn. 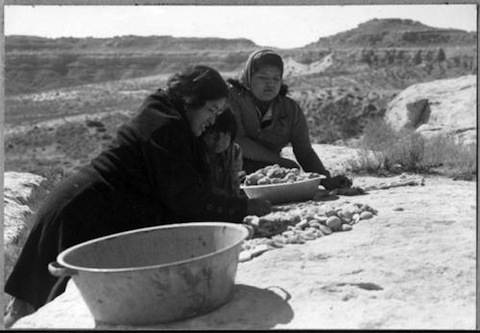 From that time on, corn has occupied a significant position in the Hopi society and culture. To the Hopi, agriculture is a way of life. Moreover, their ceremonies mark the different phases of the Hopi agricultural cycle. Shungopavi Day School students enjoying their recess. This was taken in 1944. 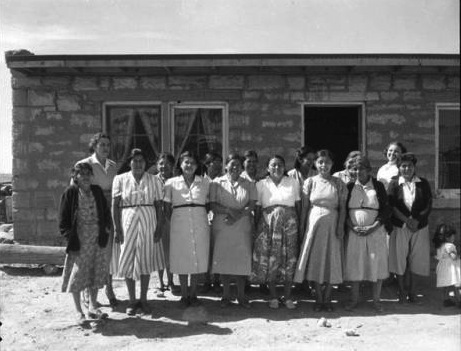 Several people volunteering for Toreva Day School in 1944. 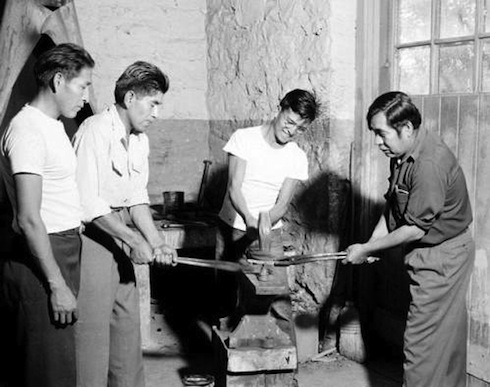 From left to right are: Ivan Seletstewa, Joseph Seletstewa, Edward Masaytewa, and Andy Seletstewa. 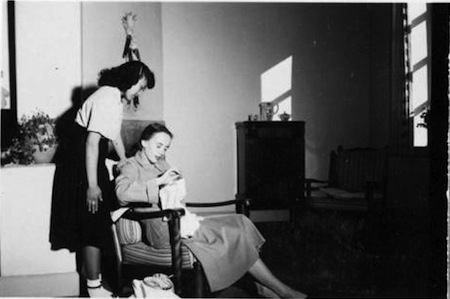 The interior of Archie and Nellie Quamala's house in Shungopavi Village in 1944. 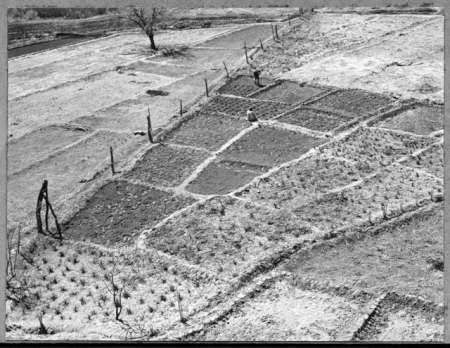 A farm plot with rows of toviga to keep the soil from blowing away. 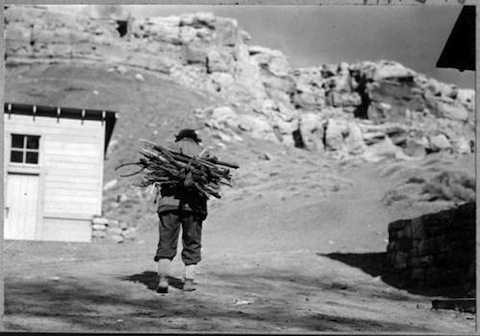 It was taken near Shungopavi Village in 1949. In the photo is Viets Lomahaftewa. 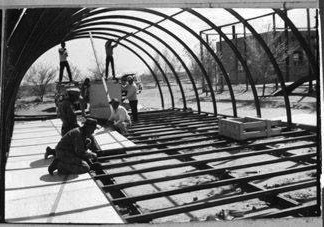 Erecting a quonset hut for the Hopi Arts & Crafts Guild. The foreman was Sam Shing [Shingoitewa]. This was taken in 1947. Hale Sekukaku's store, located between Mishongnovi and Shipaulovi. This was taken in 1944. Hopi cattle, south of Second Mesa. This was taken in 1944. 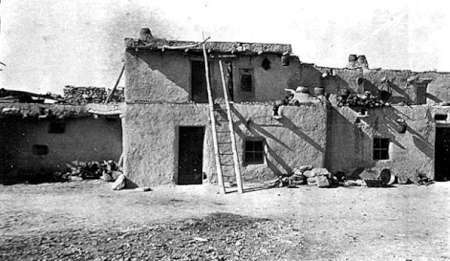 Old Oraibi on Third Mesa is thought to be the oldest settlement in the new world. It is located on top of Third Mesa, just above the town of Kykotsmovi, the tribal government seat. 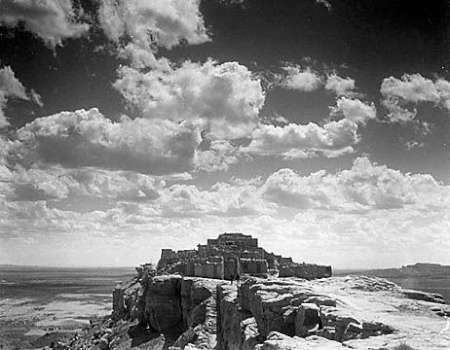 Old Oraibi is governed by a village chief and chooses not to have any representatives on the Hopi Tribal Council. The village also does not have any village administration and rejects any funding allocated to Hopi villages by the Tribal government. 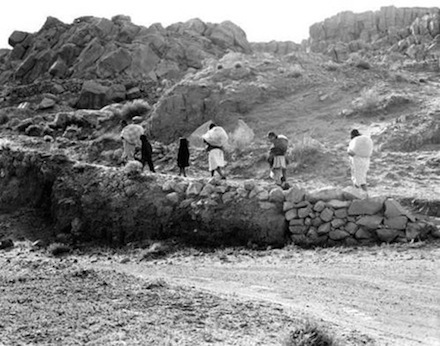 Old Oraibi was established in 1100 A.D and was designated a historical landmark on July 19, 1964. 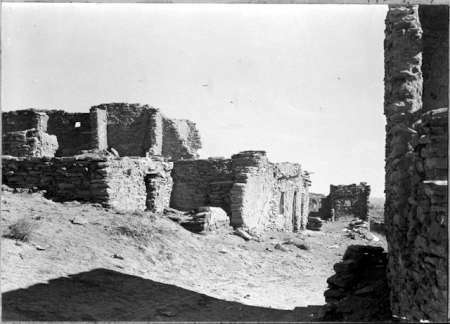 Located on the westernmost of the Hopi mesas, this is probably the oldest continuously inhabited pueblo in North America.This particular photograph was taken in 1944. 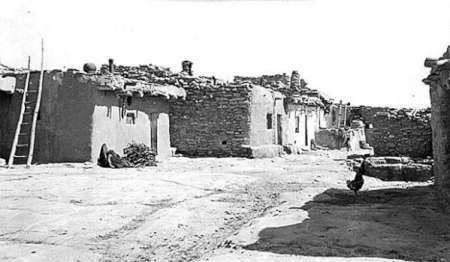 Houses in Old Oraibi Village in 1944. 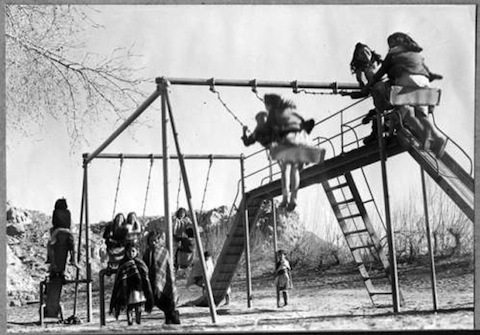 Children play in Oraibi Village in 1905. 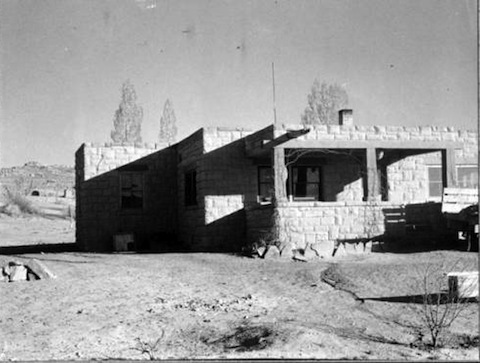 Sam Shingoitewa's house in Moencopi (Moenkopi) Village in 1944. 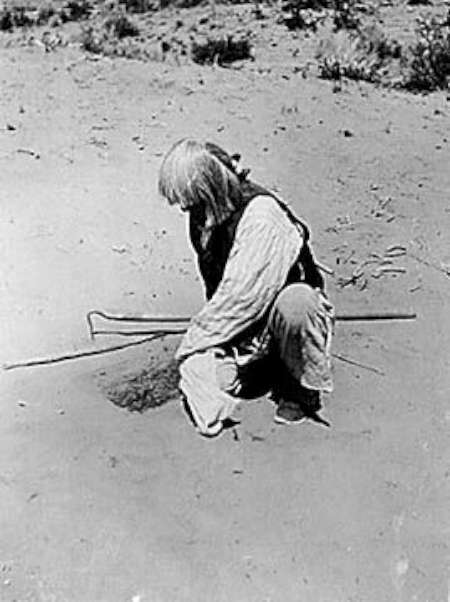 The first major dispute occurred in 1906 between two chiefs, You-ke-oma and Tawa-quap-tewa. Instead of fighting with bullets or arrows, the leaders staged a "push-of-war" contest. 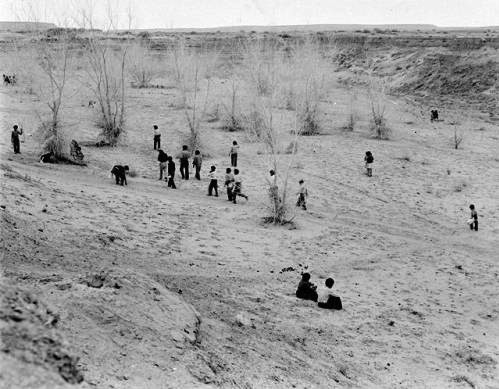 A line was cut into the mesa and the two groups stood on either side. They pushed against each other as hard as they could until Tawa-quap-tewa's group crossed the line and won. You-ke-oma, the loser, left with his faction to establish Hotevilla four miles away. This event was recorded a quarter mile north of Oraibi with the line and inscription: "Well, it have to be done this way now, that when you pass this LINE it will be DONE, Sept. 8, 1906." A bear paw cut in the rock is the symbol of Tawa-quap-tewa and his Bear Clan, while a skull represents You-ke-oma and his Skeleton Clan. Other residents split off to join New Oraibi at the foot of the mesa. 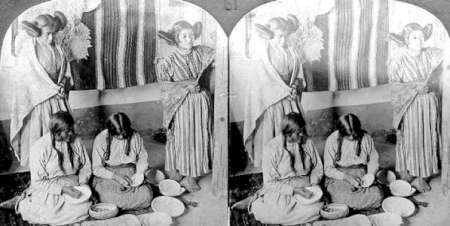 Pictured here are Hopi women. Traditionally it was the women who did the building. Therefore, they own their homes and are the head of the family. 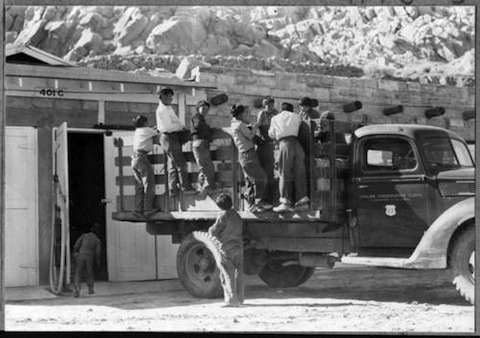 Men assisted with the heavy lifting and occasionally even helped with the masonry work. Even today the walls are still hand-plastered by women. A typical home was built using hand-trimmed sandstone and earth and grew organically over the centuries. The roofs consist of vigas (structural beams), latillas (branches used as sheathing), and a capping layer of willow twigs and earth. 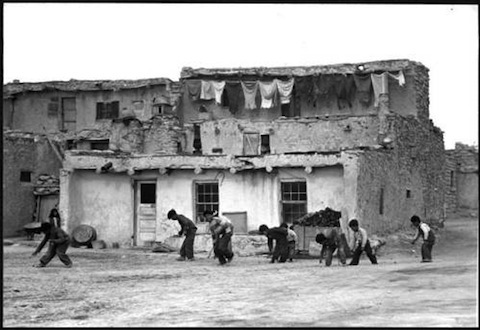 The ancestral home is very dear to the Hopi hearts of men, women, and children alike. The old Hubbell Trading Post in Oraibi. In the picture are Horace Kwani and George Sankey. This was taken in 1948. 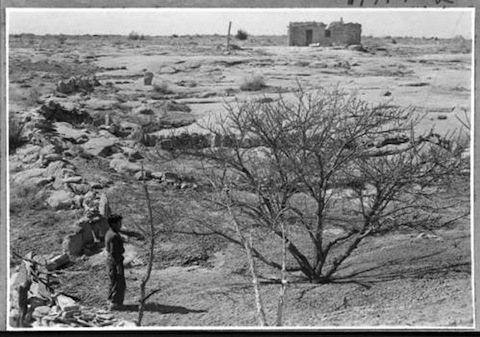 This image is of the subjugated farmland along South Oraibi Wash, 9 miles above Oraibi Village. Even with its sporadic water supply, the desert wash allows the surrounding land to be considered as suitable for farming. Chief Quaptewa (Tewaquaptewa) in his tourist regalia in Oraibi Village in 1944. The arrest of Youkeoma in 1915. Chief Quaptewa (Tewaquaptewa) and his house in Old Oraibi Village. Taken in 1944. 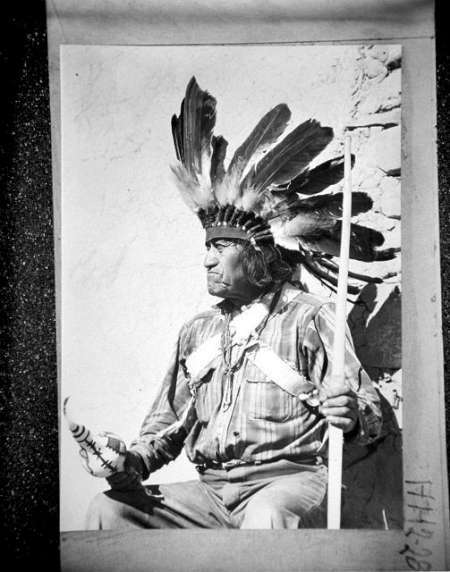 Chief Tawaquaptewa in his tourist costume in Oraibi Village. This was taken in March 1944. 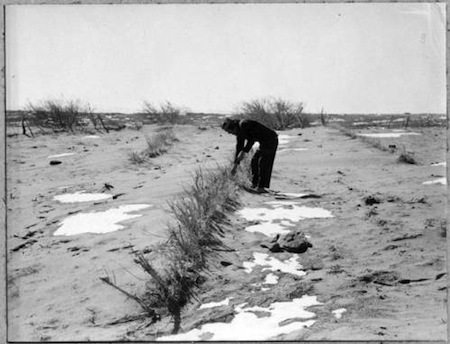 A corn planter in Bacabi in 1914. 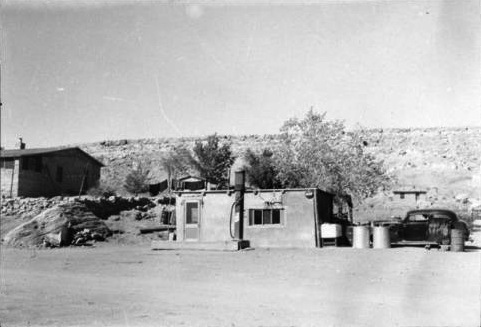 Oraibi Trading Post in 1931. Reservation Police at a snake dance ceremony in Oraibi in 1905. 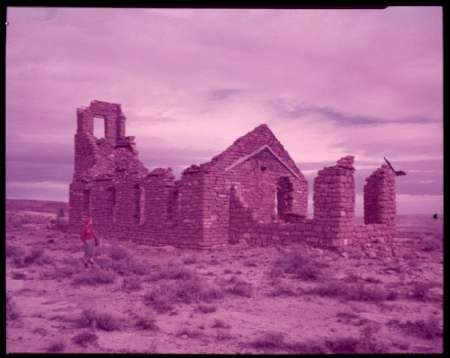 Standing out almost at the extreme tip of the Third Mesa on the Hopi Reservation is this Menonite Mission chapel, erected in 1901 and burned by lightning in 1942. 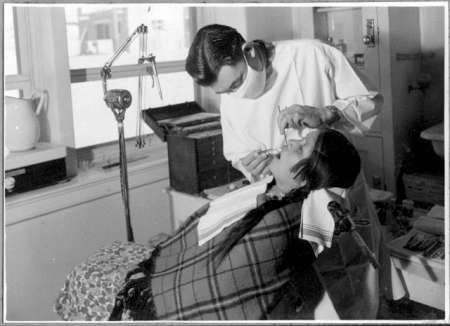 Dentist Dr. T. Shimizu and patient Effie James at Hopi High School. Taken in Oraibi, 1945. 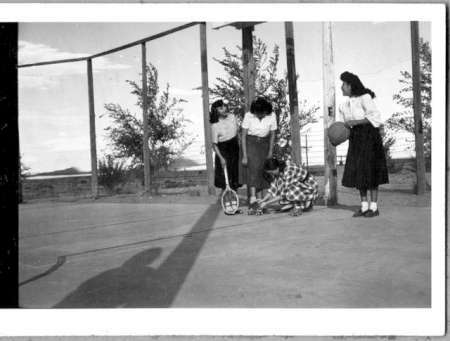 Girls and their teacher at Hopi High School in Oraibi outdoors playing sports. 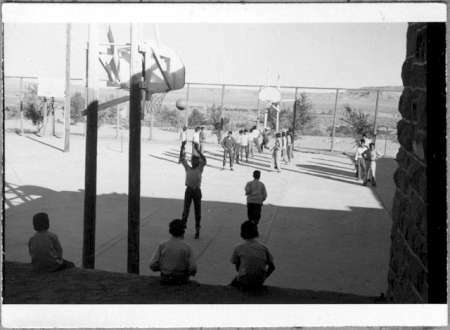 Boys at Hopi High School in Oraibi playing basketball. 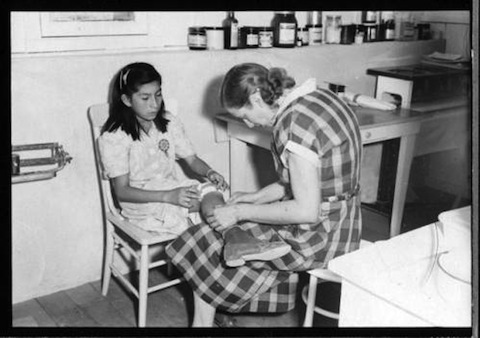 A Hopi girl watches her teacher, Miss Barbara Barnett, doing needlework. 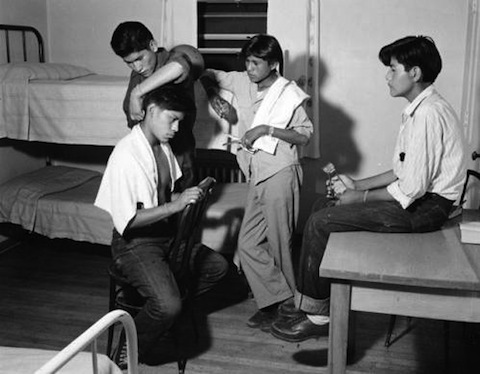 Boys in their dormitory room at Hopi High School in Oraibi. One of them is getting a haircut. 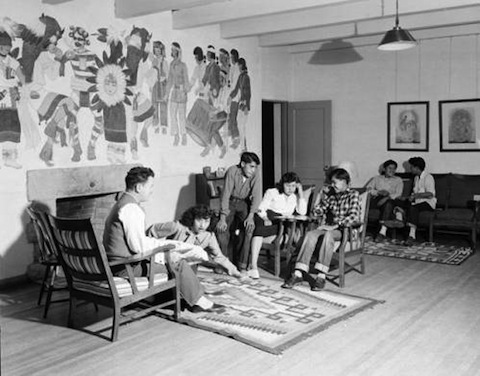 Students and their teacher in a room at Hopi High School with a beautiful wall mural above the fireplace. 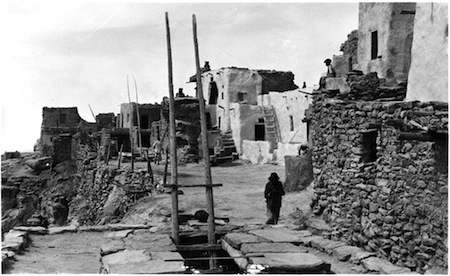 New Oraibi Village in 1944. 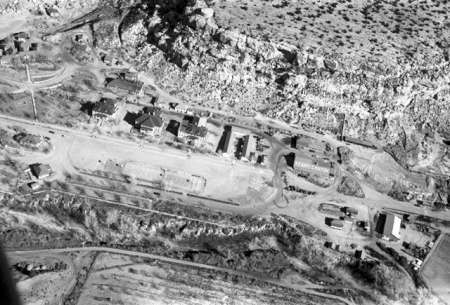 An aerial view of Keams Canyon in 1948. While serving in the military in 1863, Thomas V. Keams was sent to an area known as Peach Orchard Spring. Colonel KIt Carson was trying to capture Navajo Indians. When the fighting was over, Thomas spent time as an Indian Agent to the Navajos. 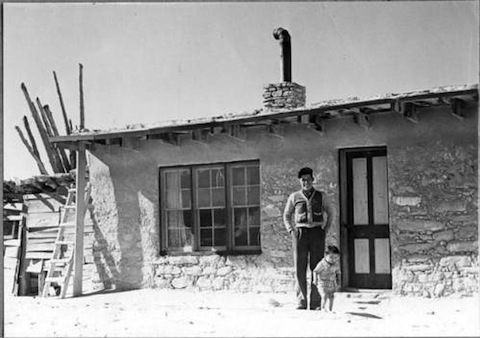 After he married a Navajo woman, they returned to Peach Orchard Spring and established a ranch. This area is now known as Keams Canyon. 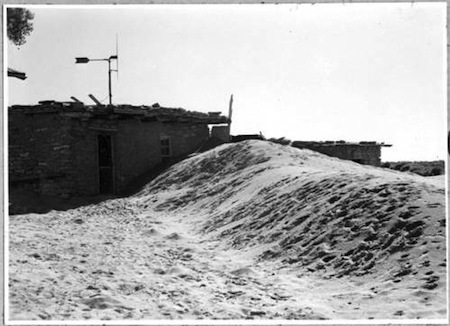 In 1869, Keams opened a trading post about three miles east of where it is currently located. 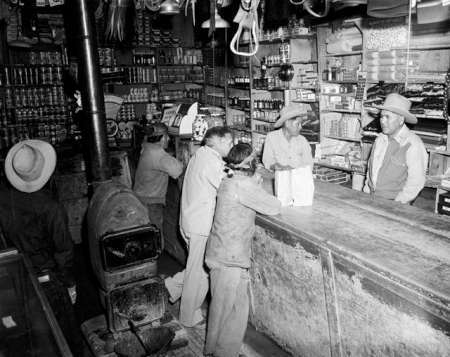 The current trading post was built in 1879. Business was mostly conducted by bartering with the Indians who traded livestock and wool for flour, sugar, and tobacco. 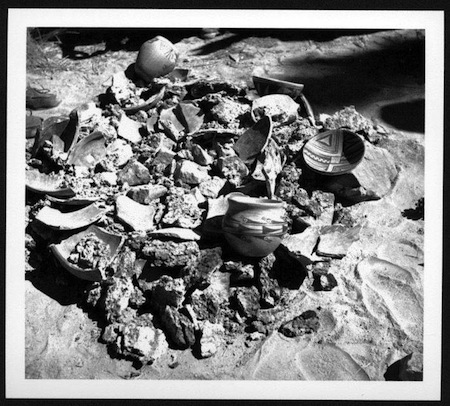 Eventually, Keams began trading for pottery which he took to the train stations and sold to passengers and later to Fred Harvey and Grand Canyon National Park. 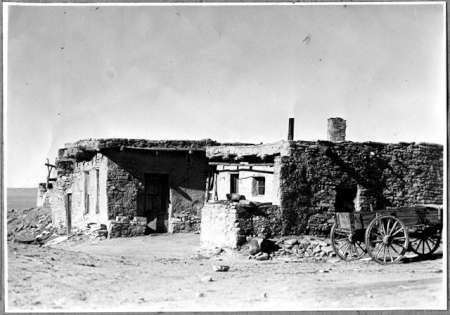 In 1906 Thomas Keams sold his trading post to Lorenzo Hubbell of Ganado. 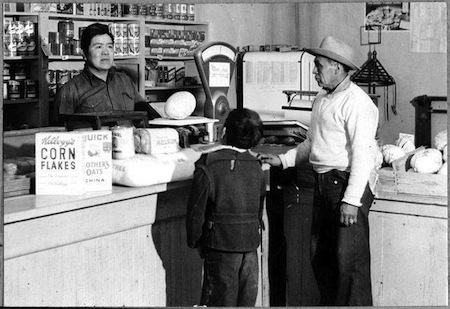 The trading post is on the Hopi Reservation in Keams Canyon, where Lorenzo was able to work with the tribes to sell their arts and crafts. 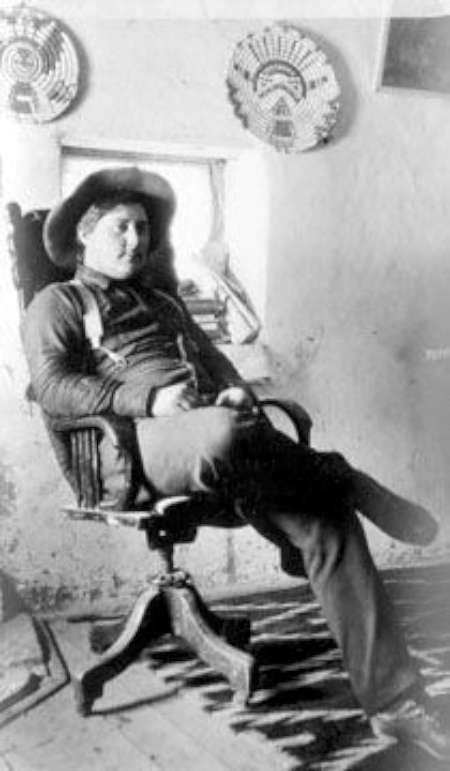 The excellent workmanship and variety of talent was recognized by Hubbell and he was able to expand his trading post along the rail lines. 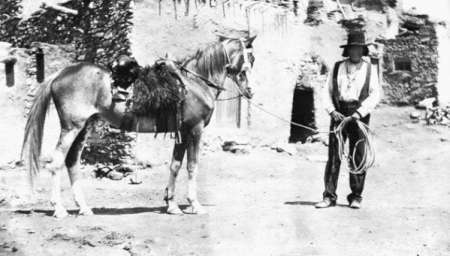 Lorenzo Hubbell, trading post owner, in Keams Canyon in 1905. 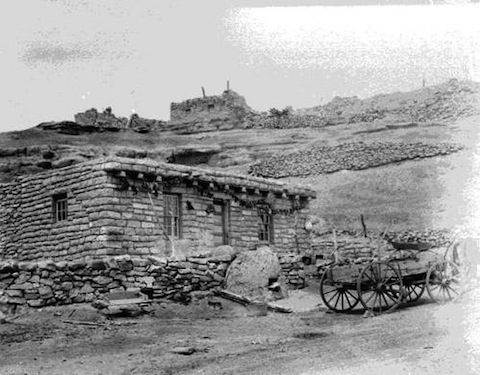 In 1875, English trader Thomas Keams escorted the Hopi village leaders to meet President Arthur in Washington D.C. Lololoma, acting chief at the time, was very impressed with Washington. He believed that education is what allowed the white man to be able to live in such a way. 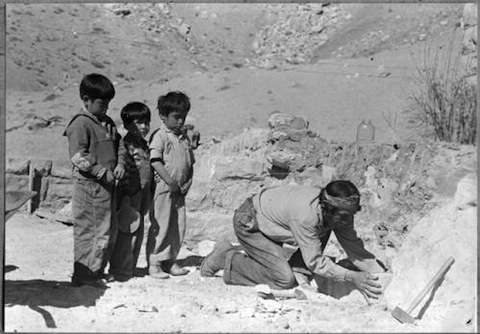 This belief caused him to want a school built for the Hopi children. 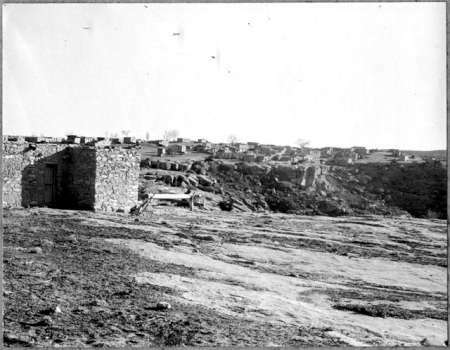 In 1886, twenty of the Hopi leaders signed a petition sent to the Commissioner of Indian Affairs requesting that a school be built on their land. 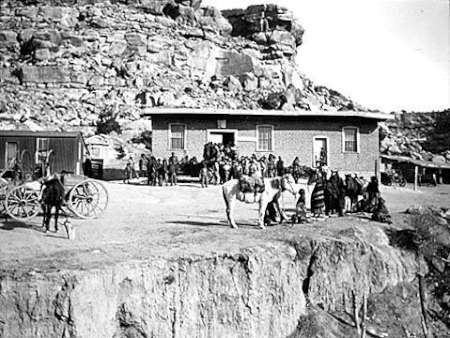 In 1887, Thomas Keams opened Keams Canyon Boarding School at Keams Canyon for the Hopi Indians. 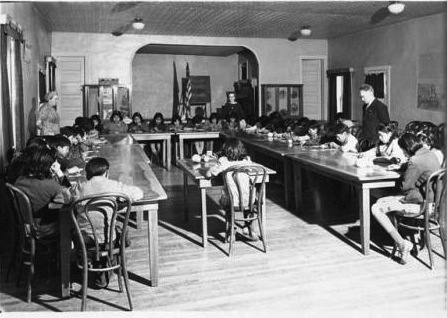 The main objective of Keams School was to teach the Hopi youth the ways of civilization by pushing Anglo-American values. 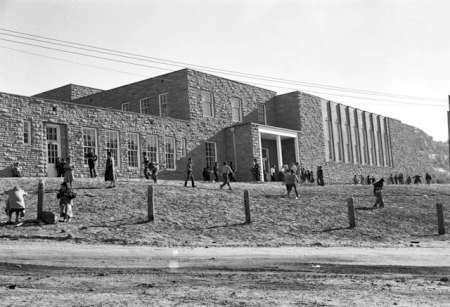 The Oraibi people were not supportive of this school. They refused to send their children to a school that was 35 miles away from their villages. The children who attended Keams Canyon School received haircuts, new clothes, took on a "white” name, and learned English. The boys learned farming and carpentry skills, while the girls were taught ironing, sewing and "civilized” dining. Keams School also reinforced American religions. The American Baptist Home Missionary Society provided the students with services every morning and religious teachings throughout the week. 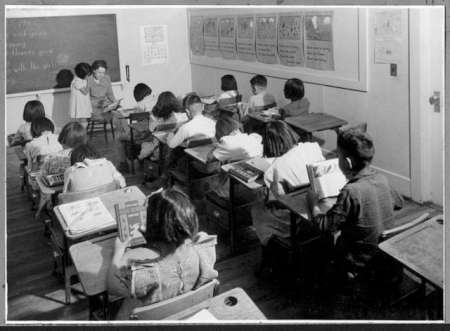 Children at their desks in a classroom at Keams Canyon Boarding School. A beginners class at Keams Canyon Boarding School. Mrs. Burton A. Ladd is the teacher. This was taken on April 23, 1943. 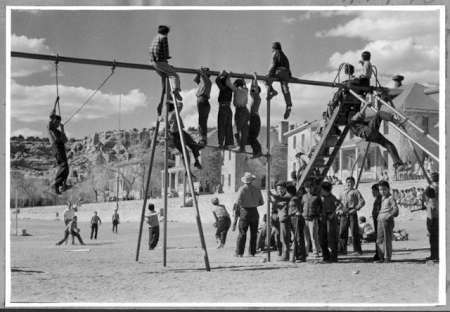 Recess at Keams Canyon Boarding School, 1945. 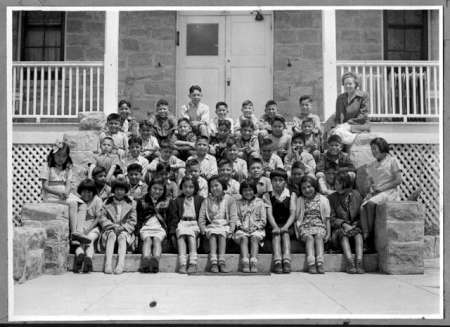 Class photograph in front of Keams Canyon Boarding School. 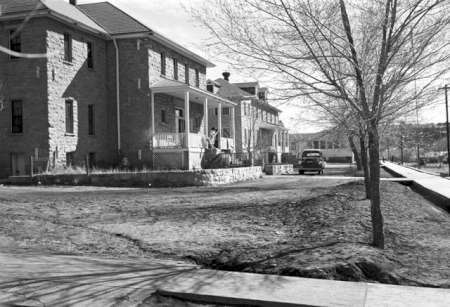 Keams Canyon Boarding school dormitory buildings and the employees club. 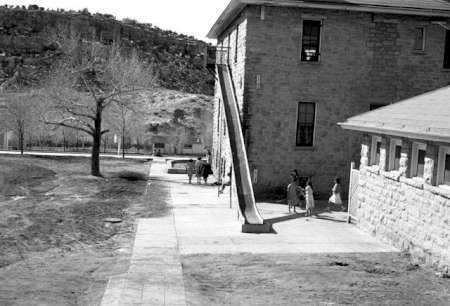 Keams Canyon Boarding School in 1951. 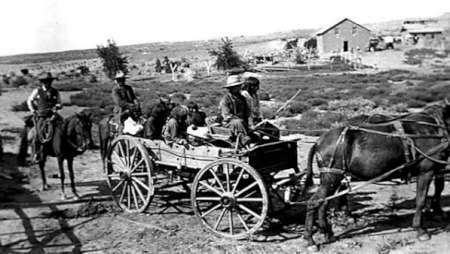 In 1863 Colonel Kit Carson and his troops were sent to help capture the Navajo Indians. Several times during their assignment they camped in Peach Orchard Springs. This area was later renamed by Thomas Keams when he returned and settled in the regions and called it Keams Canyon. 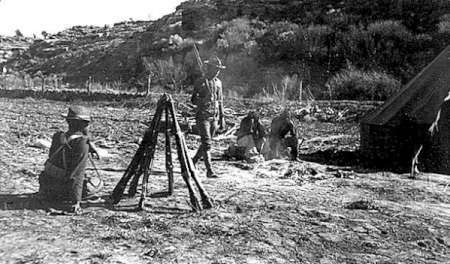 This photo of troops in Keams Canyon was taken in 1911. The chief of the Oraibi at the time, Lololoma, was very excited about Hopi education but the Oraibi people were divided on this issue. Most of the village was conservative and refused to allow their children to attend school. These Indians were referred to as the "hostiles” because they opposed the American government and their attempts at assimilation. 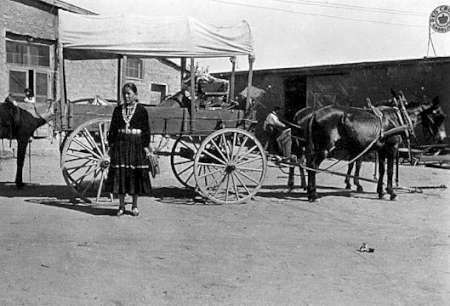 In 1894, a group of Hopi parents announced that they were against the ideas of Washington and did not want their children to be exposed to the culture of the White American people. They also said that this argument couldn’t be settled peacefully, so the government sent in troops to arrest the nineteen parents and sent them to Alcatraz Prison where they stayed for a year. 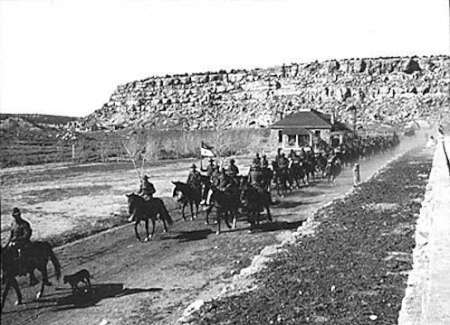 This photograph is of the 5th U.S. Cavalry Moki Hostile Prisoners Camp at Keams Canyon. It was taken in 1905. Hopi pottery, called Hano Polychrome or Sikyatki Revival, stands out among all of the pueblo and non-pueblo pottery makers. The white wash with poly-chrome painting is one of the most recognizable art styles in the world. 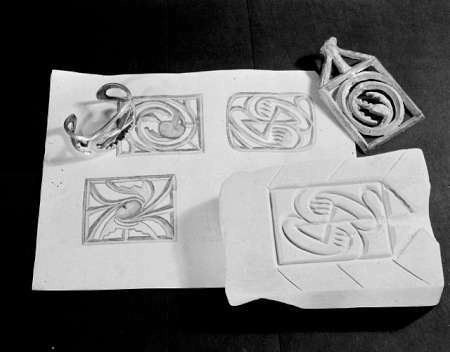 The art style is different within each family of potters. Avid collectors are familiar with the Hopi pottery by artist and almost instantaneously recognize the artists. 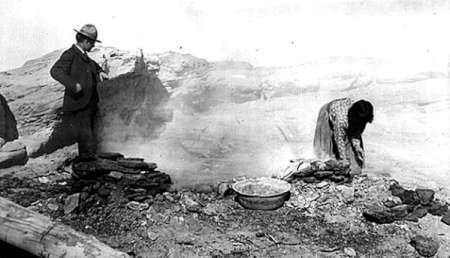 Nampeo burning pottery in Tewa, Arizona, 1905. E.A. Burbank is on the right. Pictured here is Rose Lynn Howee of Shungopovi Village in Second Mesa. The photo was taken in June 1944. 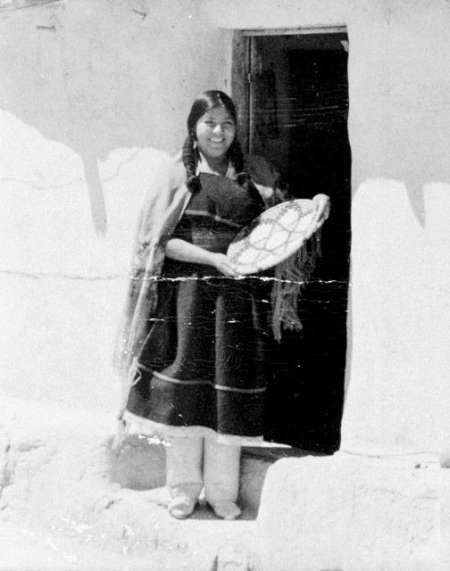 She is holding a Hopi basket and wearing a married woman's hairstyle. The dress and leggings are a traditional outfit. 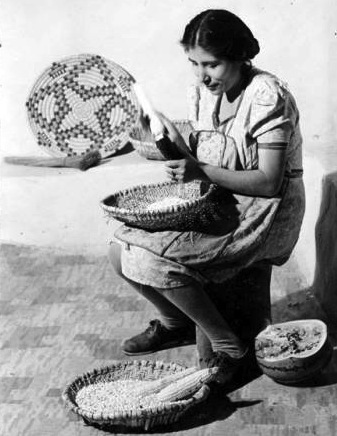 The women of Third Mesa make wicker baskets of rabbit brush. This photo was taken in 1925. 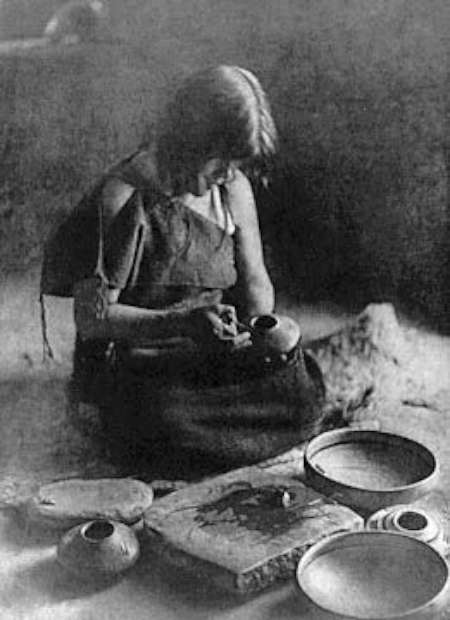 Hopi women decorating pottery in 1904. This is a stereoscope image. Stereoscopes were a popular device that allowed two images to become a single three-dimensional picture. 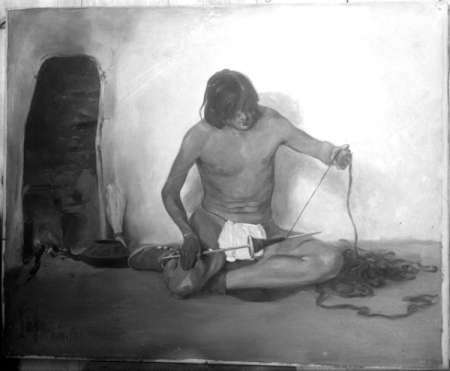 This painting of a Hopi man spinning was painted by Louis Akin. 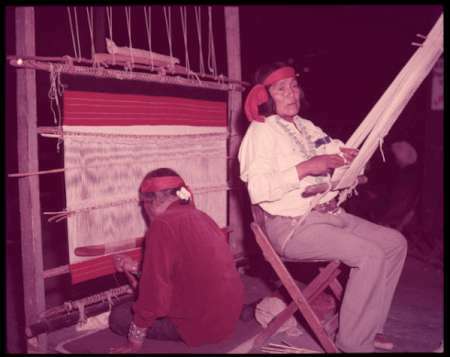 Weaving is done by men rather than women among the Hopi. 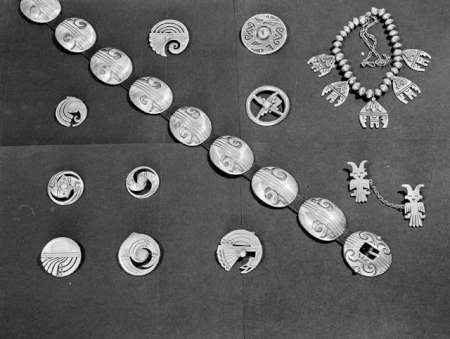 Hopi jewelry by the Arts & Crafts Guild on display. 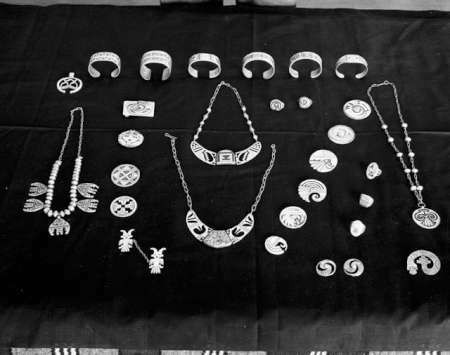 Silver jewelry exhibited by the Hopi Arts & Crafts Guild at Oraibi High School in December 1948. 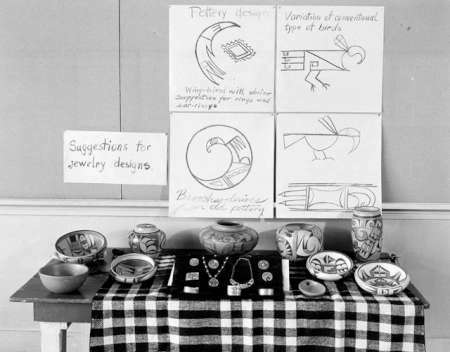 A display of Hopi pottery and jewelry. 8th grade boys in weaving at Hopi High School in Oraibi. 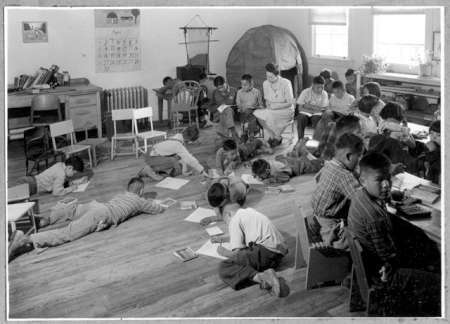 The teacher is Fred Kabotie, and it was taken in 1945. 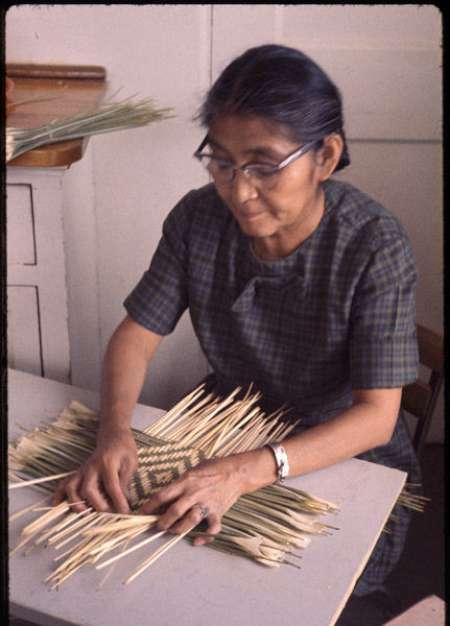 Alice Kabotie makes a Hopi ' sifter' basket of yucca leaves. This was taken in Shungopavi, Arizona in 1962. 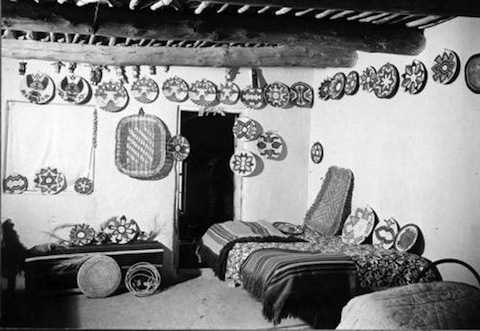 Display of Hopi baskets, pottery, kachinas, and bread. Pictured are Florence Koinva, Spencer Kewenvoyouma, Viets Lomahaftewa and Nellie Lomahaftewa in 1944. Die making: heating & cutting a section off an automobile coil spring. Taken between 1944 and 1950. 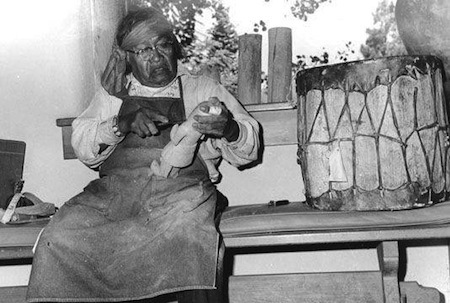 Jim Kewanwytewa carving a kachina, circa 1966. 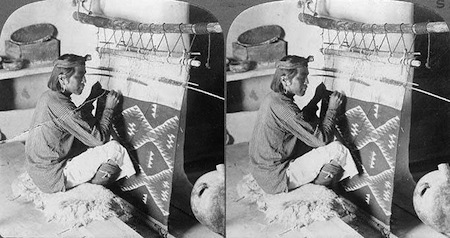 A stereograph from 1910 showing a Hopi weaving in Walpi. Stereoscopes were a popular device that allowed two images to become a single three-dimensional picture.